I have finally been back in the saddle reading some books again. It feels really good to just curl up by the fire under a blanket with your dog cuddled up to your side as you finally take that time unwind from the stress of the day between the pages of a good book. 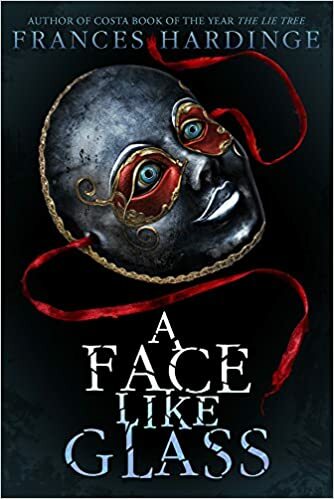 This post is about ‘A Face Like Glass by: Frances Hardinge’. Since I am a visual person, I will often pick up a book solely if I find the cover intriguing. And that’s where my journey with this book began. The cover is dark, and mysterious. It gives nothing away as far as the story, but what it does reveal is this strange mask…of glass…The exact opposite of what you would want from a mask right? Well that’s Neverfell, the heroine of our story. She is the little girl who lives in Caverna with a face…like glass. She is a strange girl whose face depicts every emotion that she feels deeply, while everyone else living in this underground city has no expression. At least not naturally. However, what these people lack in facial expressions, they make up for with excellent craftsmanship of delicacies. Cheeses and wines to make you forget or remember your most important memories. Perfumes to charmingly ensure any who stand near. Shoes to help you move swiftly and quietly. The most magnificent curiosities you could think of and more! Caverna is alive with endless possibility for creation…and destruction. Neverfell must navigate the intricacies of a highly sophisticated court with her biggest asset, and weakness on display at all times. Her face. She can’t lie. She can’t hide her secrets. And as she discovers the darkest parts that Caverna has to offer she finds that the people she thought she could trust were hiding behind masks of their very own. This book, while not containing any rough language or active violence, is incredibly dark. *Spoilers ahead* Neverfell was brought in to Caverna and used as a slave from the time of her childhood. Every person that came into contact with her was essentially using her for their own gains. They use her for slave labor as an apprentice. Use her to gain favor with Court. Use her to bring about a regime change. Use her as a scapegoat for murder. Use her as a poison tester. The list goes on. This poor girl just wants to make friends, and live a happy life with people she loves. And literally everyone around her is just out for themselves. It was breaking my heart to read this book. She grew up so twisted from the lies and schemes from these selfish people that she thought she was ugly, and insane. Well if everyone around me was lying and trying to kill me 24/7 I would go insane too! This is one of the more ‘out there’ books I have read though with a truly interesting cast of characters like The Kleptomancer, Cartogrophers that squeak like bats, A Facesmith apprentice, and a Grand Steward whose mind is split in two. Neither of which know what the other is doing. The plot twists and turns just like the tunnels of Caverna. Dangerously seductive, and without any warning. Throughout the story I thought for sure I had solved the murderer and who Neverfell’s original parents were, only to find that I was off the path. It’s a story with shadows, but it has a hopeful and surprising ending. I definitely recommend this if you are looking for something…different. It’s certainly unlike any story I have ever read before.